There aren’t many 50-year-old rock albums that have anything new to say. The only reason to give them another listen is pure nostalgia. But that’s not the case with the Beatles’ Sgt. Pepper’s Lonely Hearts Club Band. No matter how often you’ve heard it, there’s still more to hear. Sure, you know the words, the tunes, and the arrangements by heart. But have you ever focused on the dazzling harmonies that infuse every track? Or on Paul’s innovative bass playing? Or the classical music elements (counterpoint, modality, deceptive cadences, and much more) that inform the songwriting? This ia an album that rewards exploration from seemingly endless angles. Revisiting Sgt. Pepper is also a lot more fun than mere nostalgia. Start with the cover, a witty, iconic work of art. Next, the conceit it depicts: the Beatles’ death and replacement by an alter-group called Sgt. Pepper’s Lonely Hearts Club Band. The concept is entertaining and original, but it also serves to liberate both the musicians and the listener from any ingrained expectations. Nor have the hummable melodies, assorted musical styles, day-in-the-life tales, or now-serious/now-sardonic lyrics lost any of their appeal. In short, Sgt. Pepper has aged but it’s never gotten old. Which is why we now have this 50th Anniversary Edition. The project could easily have been one of those cynical commercial exercises where an arbitrary engineer creates a new master that the label pawns off as an improvement but is really just louder. Thankfully, this time there were nobler motivations at work. Understanding them requires a bit of back story. Back when Sgt. Pepper was made, mono was still the primary playback format. For this reason, the Beatles themselves supervised the album’s final mono mixing and mastering sessions. In contrast, the stereo version was an afterthought; it was created by the studio’s “B” team of engineers, and the Beatles didn’t bother to attend those sessions. Unfortunately, the mono uber alles approach was thwarted by events. Almost concurrently with Sgt. Pepper’s release, stereo gained supremacy. For this reason, whether we’ve purchased the album on vinyl or as a CD, most of us have been exposed to it only in stereo guise. Yet the mono version, which does differ in significant ways, is the more authentic. Apple, the Beatles’ label, has attempted to set things right a couple of times, first in 1982 with a remastered Beatles in Mono CD box set; and later, in 2014, with a 180-gram mono vinyl box set taken from the original analog tapes. Still, although these releases did allow us to hear the album as the Beatles had intended, they were still in mono and thus missing the spatial benefits of stereo. In steps Giles Martin, son of the Beatles’ indispensable producer George Martin and a proven producer himself. Martin thought it would be nice if we Sgt. Pepper fans could experience the album in a stereo version that more closely hewed to the Beatles’ musical vision. The result of his efforts, which purportedly involved months of research, is this Anniversary Edition. The new album is available on CD and LP. (Sadly, Apple still hasn’t seen the light on hi-res downloads.) Both formats are available with either one or two discs. In the latter instances, the first disc is the original album, while the second replicates the album’s songs, in order, but with an alternate take of each. The second CD—but not the second LP—also includes three alternate versions of “Strawberry Fields Forever” and two of “Penny Lane.” Both songs were recorded during the Sgt. Pepper sessions, although they were subsequently released as a single. This new material proves to be mostly of academic interest; you’ll likely play it once and then stick with the main album. However, for die-hard fans there is value in these tracks. 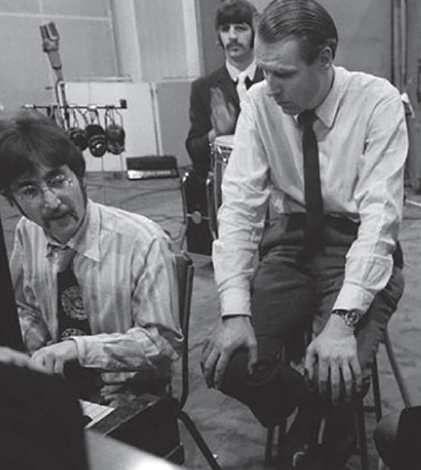 For instance, the bonus CD offers the two versions of “Strawberry Fields Forever” that John Lennon challenged George Martin to combine into one—even though they were in different tempi and keys. The instrumental tracks highlight Ringo’s varied and original playing, which is often submerged in the final mixes. Also, because the bonus tracks are presented in their originally-recorded speeds and keys, you can hear how extensively the Beatles used variable-speed tape decks to make last-minute tempo and pitch adjustments. Finally, the bonus album contains a version of “A Day in the Life” with the originally-conceived ending: a large group humming an E natural. The band concluded that, after the song’s monumental orchestral crescendo, ending with a hum was anti-climactic. After listening to this ending, you’ll no doubt agree. The group decided instead to deploy an array of keyboards (mostly pianos) hammering a single E major chord in unison. The rest, as we know, is history. Yet for most fans the Anniversary Edition’s promise is for greater authenticity, better sound, and less clunky stereophonics. For me, it’s a split decision. First, the sound. The original LP and CD of Sgt. Pepper are quite similar sounding. They share thin tonality and pond-flat dynamics. The CD is worse due to sharp highs and pervasive edginess that make it hard to listen to. A 2009 CD remastered by Guy Massey and Steve Rooke smooths and fills things out. Rhythms have more drive, dynamics have some life, and the superior transparency makes details more audible. Not surprisingly, since it was made from the very same digital remasters, the LP found in The Beatles 2012 vinyl box set sounds very much like this CD. Both constitute worthy upgrades over their predecessors. As for the mono versions, I listened to the Beatles in Mono CD and it didn’t sound great. Aside from the expected soundstage shrinkage, this version represents a return to squat dynamics and tonal anemia. Rhythms plod along. On some tracks, Paul’s bass is virtually MIA. In sum, other than from an authenticity perspective, this version was a step backwards. I haven’t heard the LP version, but I’d expect it to be significantly better since it was derived from the original analog tapes. We come now to the 50th Anniversary Edition, and in either format it sounds awesome. Tonal balance is just right, there’s abundant clarity without any accompanying edge, and the tracks move along briskly. Many details—right down to the individual vocal lines within clustered harmonies—are newly apparent. At the same time, this version fixes the original stereo release’s most egregious errors. It’s great to hear “She’s Leaving Home” in its proper key, and the album returns Paul’s scatting at the end of “Sgt. Pepper (Reprise)” to prominence. If the new mix and stereophonics were equally laudatory, this album would be a watershed event. Sadly, this is where the younger Martin fails us. He boosted all of the vocals—as well as certain instruments—to the point where they’re right in your face. And there’s no letup. So rather than the Beatles’ carefully-plotted journey through emotional highs and lows, Martin gives us an album that’s unremittingly aggressive. Rather than inviting you into a fascinating world, as even the lousiest-sounding predecessors did, the new edition pushes you away. Individual songs suffer, too. For instance, on “She’s Leaving Home” McCartney seems more pissed off than ruefully contemplative. Similarly, the lead guitar on the title track morphs from a knife-edged accent to something downright menacing. Both of these new elements are incongruous with the emotional makeup of their respective songs. I also take issue with some of Martin’s stereophonic choices. Why, for example, should the first three notes of the harpsichord theme that introduces “Lucy in the Sky with Diamonds” be placed in the left channel, while the fourth (and others) find themselves in the right? The effect not only comes across as arbitrary, it distracts from the musical line. And that’s the common thread here. Martin seems to have placed a gee-whiz mix and “look what I can do” stereo effects above the music. Despite the nobility of his intentions, it’s worth noting that in the end this Anniversary Edition is still a stereo mix created without any involvement from band members. In that respect, it’s no more authentic than prior stereo releases. Yes, it sounds better; but it’s far less involving and loses much of what the Beatles hoped to express. For me, it’s not worth the sacrifice.